When we were in Southern Mexico, we had to contend with the Tehuantepecs, forceful winds that tear across the skinny bit of Mexico from the Caribbean and pummel any boats blithe enough to try to cross their path. Halcyon did not enjoy her time in the Tehuantepecs (you can read about that passage here). After the slightly broader and hilly section of southern Mexico and Guatemala, which tames the winds funneling across from the east, there is another set of named winds: the Papagayos. These are generally less brutal than the T-peckers, as there is a bit more land mass and a bit less force on the Caribbean side. As we bobbed down the coast, we kept an eye on Papagayo forecasts, but we weren’t too concerned. The main advantage of these winds over the T-peckers is the many bays along the way that offer protection from the brunt of the wind and building chop. It turns out the disadvantage of these winds is that apparently THEY NEVER STOP. We first felt the Papagayos when we were in Playa Redonda in mid-January. We chose a day forecasted to be slightly less blustery to make the 15-mile jump from there to San Juan del Sur, but could hardly anchor for the winds that whipped across that bay. We spent a week tucked in there, enduring salt-encrusted everything from the spray blowing off the beach break at 30 knots, straight at Halcyon. Finally, once we had done our internet-ing and our provisioning, filled our propane and gas and diesel and water, we could bear it no more and hauled anchor to head south. Our only condition for any bay we encountered was: is it protected from the Papagayos? We found a few in southern Nicaragua where the winds funneled between hills and hit us with slightly less force, but from many directions. Our 25-mile sail from Guacalito (an incredibly beautiful bay in southern Nicaragua) to Bahia Santa Elena in Costa Rica had us bashing through 3-5 foot wind waves and leaning into 30-35 knots, with long minutes-long dramatic gusts of 40 or 45. The wind was mostly kind of behind us, which made for a fast ride – we averaged 7 knots and saw speeds over 9, but it was quite uncomfortable. About a week later, the winds were still whipping when we attempted, then turned back, then attempted, then turned back, then attempted and finally accomplished a 7-mile sail right into the teeth of the winds to reach a tiny town to re-provision and pick up guests. Phew! The winds were still screaming through the canyons another week later when we made the hop from Bahia Portrero Grande to Playa del Coco. 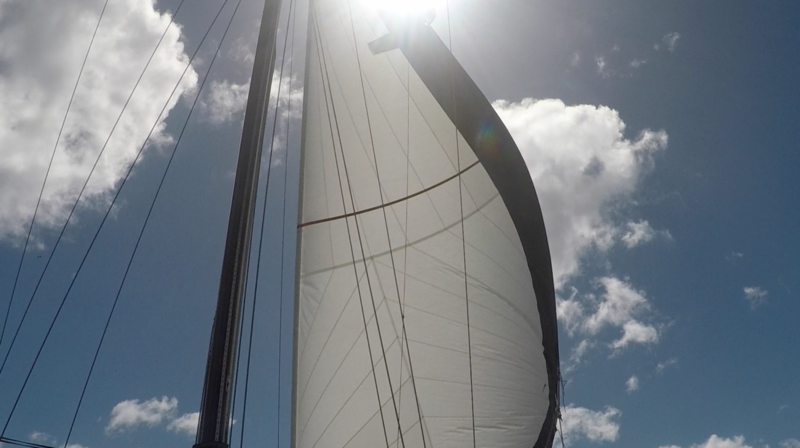 It started mildly enough, with 15 knots on the beam, until we were suddenly blasted with 30 knots on the nose. And then it just kept on blowing. Some days the wind is fun and exciting – sailing fast and ducking behind the dodger to avoid the plumes of seawater drenching the boat. We can certainly sail faster than we can motor in these conditions, which is always a nice perk for our aging engine. But other days I want to yell up at the sky to just give us a break for a minute! I’d like a moment to brush the hair out of my face, wipe the salt out of my eyes (and perhaps off of every other surface of myself and Halcyon), maybe even sail with more than a heavily reefed jib. There are not many cruisers down here, and perhaps those stubborn papagayos are part of the reason. But I can say one thing for certain — it is worth it! This coastline is the most stunning of them all, with steep volcanic cliffs and dramatic rock spires, secluded white sand beaches backed by miles and miles of national park, estuaries full of old growth mangroves and thousands of birds. Sunset brings out the child-like laughter of parrots flapping from tree to tree and the deep growling bark of howler monkeys. The morning brings – well – more wind, but also a cobalt blue sky dotted with white fluffy clouds streaking by. The seas are full of fish – some for catching and eating, others for admiring among the rocks – as well as sea turtles and jumping rays. We absolutely love it down here, despite – or maybe it’s because of – those persistent Papagayos. The Papagayos are as described….and Dad and I enjoyed our experience on Halcyon in spite of those constant winds. The anchorages, the water time, the beach sunsets, and especially that fresh caught 20 pound mahi mahi provided excellent memories with you two. Loved our visit. It was fun! And the wind is still blowing! So the wind blows all day long, morning, afternoon and night-time? Wow. Surprising because I would think there would be some land heating / cooling effect, or at least some respite at certain times / days. Makes me appreciate the PNW, which I can always find a protected anchorage (but sometimes have the opposite problem, of no wind for days). They don’t necessarily blow all the time, but they are completely unpredictable. Island effect seems to have little sway on these winds. Sometimes they howl all night, sometimes it is calm at 8am and blowing 30 at 8:30! They are definitely not as presicable than the winds in the PNW. Love reading y’all s adventures. Keep safe.